Plasmodium falciparum is a complex eukaryote parasite belonging to the Apicomplexa phylum, and it is one of the world’s most pathogenic microbes: it is the ethiological agent of malaria. Its life cycle take place in two animal species: human as intermediate host and female Anopheles mosquito as final host. In humans the parasite lives mainly within cells, protected from most circulating antibodies. In detail, sporozoites injected by mosquito infect hepatocites , where they grow towards the stage of hepatic trophozoites and then schizonts. After lysis of hepatocytes, merozoytes spread into the bloodstream and red blood cells (RBC) invasion occurs. Merozoite stage : The free merozoite is very small, 1.2 mm long, but it contains all the necessary to invade and establish itself in a new RBC; it can live about two hours out of the RBC. During this asexual cycle in the blood, a small percentage of parasites choose not to follow asexual multiplication and instead develop into sexually committed cells, the female and male gametocytes, which are the precursor cells of the gametes. These cells are arrested in the G0 phase of the cell cycle and are only activated to produce the gametes in the midgut when ingested as part of the bloodmeal of the female anopheline mosquito. Gamete formation is followed by fertilization, resulting in the diploid zygote. After one round of meiotic division, the zygote develops into a motile ookinete that penetrates the cells of the midgut and traverses the midgut wall to form an oocyst on the basolateral lamina. After growth and multiplication, >10 000 sporozoites develop in a single oocyst. The motile sporozoites are released 17 days after the initial bloodmeal and migrate via the haemolymph to invade the salivary glands, from which they are ready to infect a new victim and continue the cycle. The entire blood cycle takes about 48 hours, and fever in patients infected by P. falciparum is due to hemolysis induced by the breaking out of schizonts releasing merozoites to infect fresh RBC. Why are RBC the best nutrients for Plasmodium? We have tried to explain in the scheme below the reasons that explain the choice of Plasmodium: from RBC it can obtain P (stored in RBC as 1,3-Bisphosphoglycerate, 1,3-DPG ), that is also useful to uptake Fe : in fact after 4 reactions the uptake of 1P is translated in the reduction of 2Fe3+ to 2Fe2+ using 2e-. Only Fe2+ can enter the cell. In addition from RBC it can obtain aminoacids and Fe2+ directly from the haem. But the degradation of haemoglobin in an acidic food vacuole causes also the production of redox active by-products: heamozoin is one of these. Other reactions that begin from heamozoin (HZ) provoke ROS development and degradation products (i.e. 4-hydroxy-nonenal, HNE). The presence of heamozoin and of damaged proteins, such as band 3, induce macrophages to phagocytate RBC. All these mechanisms enhance the amount of ROS: consequences of this increase are from one side the attempt to repair of Plasmodium (NADPH, thioredoxin) and from the other side protein damages (band 3 and spectrin). From RBC Plasmodium can also take inorganic P: this P, in fact, is not used from RBC for the proliferation (without the nucleus the cell at this differentiation stadium isn’t able to proliferate), but is uptaken for the effects that has on the Fe, and is then stored in the 1,3 DPG. This situation is really peculiar: the cell contains a lot of P that is not actively used, so Plasmodium can attack 1,3 DPG to obtain P. However 1,3 DPG can undergo to degradation, transforming in ATP + 3 PG. DPG, in association with pH and HCO 3-/CO 2 modulates position and shape of the oxygen dissociation curve. 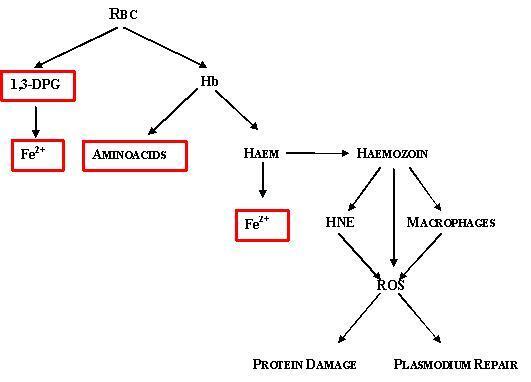 Haemoglobin represents the major source of amino acids for Plasmodium, but its degradation in an acidic food vacuole results in the production of toxic free haem (FerroProtoporfirin IX, FP) and ROS. Haemoglobin degradation by the malarial parasite produces the redox active by-products, free haem, hemozoin and H 2 O 2 , conferring oxidative insult on the host cell. However, the parasite also supplies antioxidant moieties to the host and possesses an efficient enzymatic antioxidant defence system including glutathione- and thioredoxin-dependent proteins. Mechanistic and structural work on these enzymes might provide a basis for targeting the parasite (Figure 2). helps to maintain the osmotic integrity of the infected cell. At the pH of the food vacuole (pH~5.2) the FP in oxyhaemoglobin is oxidised from the Fe2+ to the Fe3+ state with the consequent production of superoxide that dismutates spontaneously to H 2 O 2 and O 2 . Both FP and H 2 O 2 are toxic molecules that the parasite needs to destroy or neutralise. 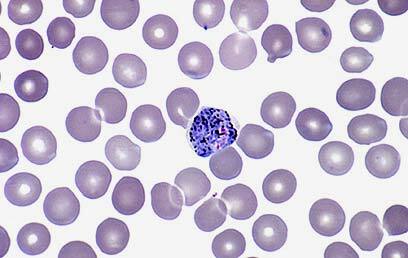 The FP is sequestered into a crystalline form named “haemozoin”(HZ), from which derives the characteristic malaria pigment visible in smears of infected blood. Degradation of FP has been proposed as an alternative mechanism for detoxification, but it seems that at least 90% of the iron is in the form of HZ. A part of the FP population escapes the crystallisation process and diffuses down the concentration gradient into the parasite cytosol. The redistribution of even a small fraction of the 20 mM cellular load of FP is likely to cause damage to host proteins and membranes. It has been shown that the FP not sequestered in haemoglobin or haemozoin (i.e. ‘free’ FP), can be present at concentrations up to 100 mM in parasitised RBC, free FP at levels much lower than this have been shown to inhibit parasite enzymes, lyse erythrocytes and cause substantial redox damage. Plasmodium digests up to 75% of erythrocyte haemoglobin during its maturation from the ring to the trophozoite form and polymerizes the undigested haem moiety to haemozoin (HZ) close to the membrane of the digestive vacuole of the parasite, provoking lipid peroxidation. In vitro, isolated HZ catalyses the peroxidation of polyunsaturated fatty acids with subsequent degradation to HNE and other degradation products. In non-parasitized erythrocytes exogenously added HNE concentrated within the membranes and formed covalent adducts with cysteine, lysine and histidine residues in proteins, and was a potent mediator of a variety of biological effects. Decreased erythrocyte deformability is present in malaria, and was found to correlate with the degree of anaemia. In vivo, the HZ-containing trophozoite as well as isolated HZ are phagocytic targets for monocytes/macrophages. There are two general possibilities for the future of protein–HNE adducts: first is the degradation of HNE-modified proteins by the 20 S proteasome, second is the cross-link of proteins, its accumulation, if not or almost not degradable, finally leading to cytotoxicity. HNE, which is generated by peroxidation of membrane lipids, is expected to react with not only cell membrane proteins but also intracellular elements. One possible major intracellular target is glutathione (GSH), which carries SH groups. Liu et al. (2000) actually showed that exogenously added HNE quickly reduced cellular GSH levels. Paralleling the change in GSH levels, the levels of GSSG decreased, suggesting that HNE directly reacts with GSH for consumption rather than acting as a source of pro-oxidants to simply promote GSH/GSSG exchange. It is, however, also possible that HNE decreased the GSH pool through inhibition of GSH synthesis. Oxidation can induce many changes in proteins, including amino acid modification, fragmentation or aggregation. Some of these oxidative modifications cause an increased susceptibility of oxidized proteins towards proteolysis, possibly due to an increase in surface hydrophobicity of the protein. We would like to focalise the attention on the damages of 2 proteins that are part of RBCs: band 3 and spectrin. Cl-/HCO 3- exchange across the plasma membrane on a one-for-one basis. This is crucial for CO 2 uptake by RBCs and conversion (by hydration catalysed by carbonic anhydrase) into a proton and a bicarbonate ion. The bicarbonate is then extruded from the cell by the band 3 molecule. Physical linkage of the plasma membrane to the underlying membrane skeleton (via binding with ankyrin and protein 4.2). This appears to be to prevent membrane surface loss, rather than being to do with membrane skeleton assembly. What are the consequences of band 3 oxidation? Knowing that hemichrome/free heme/iron damage has a non-random occurrence in space, it has been observed that the long cytoplasmic domain of band 3 is a high affinity binding and propagation site for both heme and hemichromes. This domain is considered a major organizing centre of RBCs and an anchoring site for a number of membrane associated proteins. This association propagates beyond the stoichiometric unit complex between the two moieties as it creates a polymer of macromolecular dimensions, promoting clustering of band 3 in the membrane. Several authors have proposed mechanisms for recognition and phagocytic removal of senescent or damaged RBCs based on oxidative and non-oxidative clustering of band 3 as the starting event with subsequent opsonization and phagocytic removal by circulating or resident phagocytes. Spectrin is a cytoskeletal protein that lines the intracellular side of the plasma membrane of many cell types in pentagonal or hexagonal arrangements, forming a scaffolding and playing an important role in maintenance of plasma membrane integrity and cytoskeletal structure. In RBCs dimeric spectrin is formed by the lateral association of αI and βI monomers to form a dimer, dimers then associate in a head-to-head formation to produce the tetramer. End-to-end association of these tetramers with short actin filaments produces the hexagonal complexes observed. Association with the intracellular face of the plasma membrane is by indirect interaction, through direct interactions with protein 4.1 and ankyrin, with transmembrane proteins. In animals, spectrin forms the meshwork that provides red blood cells their shape. It has been shown that oxidation damages on this protein can have a coadjuvant role in the immunological process triggered by band 3. However, if even a small amount (e.g. 0.5%) of the FP escapes these neutralisation processes, it could cause redox damage to host proteins and membranes, inhibit parasite enzymes and lyse erythrocytes. In advance the production of ROS by the host immune system adds to this oxidative stress. In order to maintain a redox equilibrium, malaria parasites contain a lot of low molecular weight antioxidants (mainly the tripeptide glutathione, GSH) and antioxidant enzymes (that include glutathione- and thioredoxin-dependent proteins and superoxide dismutase). To reduce FP-mediated damage, the parasites possess additional mechanisms for "detoxifying"any FP that escapes incorporation into haemozoin. One possible way for destruction of FP is by reaction with GSH. This will produce free iron, which in the reducing environment of the parasite cytosol, might participate in the Fenton reaction. As an additional protective mechanism, the parasite produces a series of FP-binding proteins that may protect against the toxic effects of FP: the histidine-rich proteins, HRP2 and HRP3. HRP2 enhances the conversion of FP to hemozoin in vitro: it is largely exported out of the parasite and may play a role in protecting the host cell cytoplasm. Indeed, it has been shown that HRP2 can modulate the redox properties of FP by increasing its peroxidase-like activity, which suggests that it may help protect parasitized erythrocytes from oxidative insult( Figure3 ).